Nethermost Pike is the second highest fell in the Helvellyn Range (if you take Lower Man as part of Helvellyn). It forms the second step up the ridge from Grisedale Tarn to Helvellyn, after Dollywaggon Pike. From the west the fell is a rather indistinct bulge in the ridgeline, but from the east it is rather more dramatic, lined with crags and with a long ridge that runs east between Nethermost Cove and Ruthwaite Cove. These impressive coves form a major part of the view for the walker in Patterdale - lower down the valley Eagle Crag, at the eastern edge of the ridge, dominates, but the main crags come into view further up. This eastern view must be responsble for the 'Pike' element of the name, which really doesn't suit the fell at all! Nethermost Pike is normally reached on the way to or from Helvellyn. The main path from Helvellyn to Dollywaggon Pike actually passes to the west of the summit, but the diversion is almost effortless. 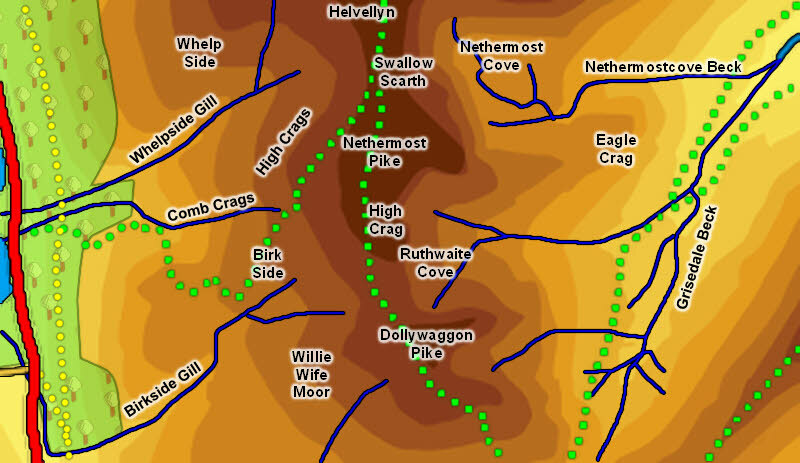 The only direct route up the fell comes from the west, and follows one of the main Helvellyn paths. This route starts at the southern end of Thirlmere, run up to the south of Comb Gill, then behind Comb Crags and High Crags and reaches the ridgeline just to the north of the summit. Our ascent of Helvellyn visits Nethermost Pike. Nethermost Pike has a large triangular summit plateau, with a narrow southern extension that runs down to High Crag, which is only seven meters lower than the summit. The highest point on the summit is towards the northern tip of the triangle, overlooking Nethermost Pike. The most dramatic part of the plateau is probably the eastern point of the triangle, at the top of a ridge that runs east down to Eagle Crag. On the western slopes Birkside Gill forms the boundary with Dollywaggon Pike, flowing south-west down the fell, then north into Thirlmere. Comb Gill forms on the western slopes, flows past Comb Crags and runs into the lake. The western boundary with Helvellyn is formed by Whelpside Gill, which runs west/ south-west to the lake. To the east Nethermostcove Beck, rising in Nethermost Cove, is the boundary with Helvellyn and Striding Edge. A nameless beck flows out of Ruthwaite Cove, forming the boundary with Dollywaggon Pike. The tiny Hard Tarn sits below Nethermost Crag, south-east of the summit.